‘ This recipe is another versatile family hit that is delicious served both cold and hot. There is an explosion of flavour in every bite and you won’t want to stop eating them! This recipe has Dairy Free and Super Skinny variations. Super yummy! We made a double batch (separately) as I could only buy the feta in 250g and wasn’t sure what else I would use it for. Even yummy the next day. I just put Bulgarian feta into my online shopping and it came up with either sheep or goat feta. Is this right? These are to die for ! A perfect partner to the tzatziki, which I struggled not to eat with a spoon. We devoured the lot in one meal and immediately made another lot with chicken. 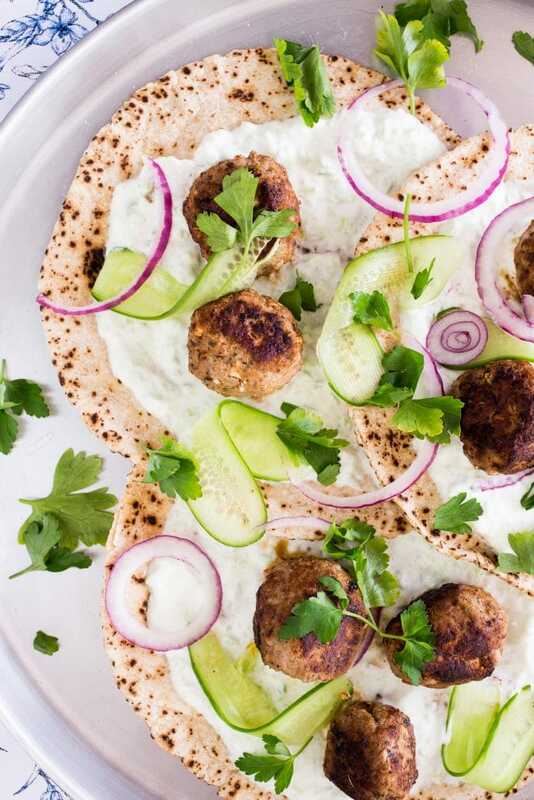 Perfect lunchbox filler with salad, couscous ,hummus and tzatziki. Another super easy, delicious dish! The meatballs have so much flavour. I served them with the SM pita bread. Another simple recipe that tasted delicious and great not only for the adults but the young kids too. 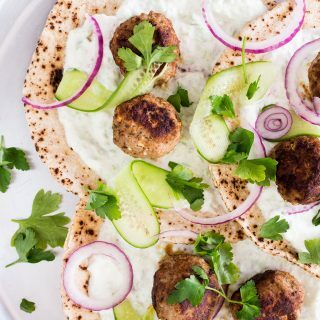 I served this with the pita wraps and it was yum! Thank you! Delicious. The tzatziki was amazing and made a large amount. Served with Skinnymixers wraps and salad. These are delicious. They were also great dairy free and with chicken. I oven baked them so avoid me forget I’m using a pan lol.